HOPING TO OPEN BY EARLY JUNE! Construction is well underway. We are getting walls this week!! Everything is still very challenging... Two steps forward, One step back it seems! As soon as the walls are finished, next is paint and wallpaper, and then flooring. After that will come the big move-in... furnishings, inventory, decorating, and so forth. We have an updated tea menu. Please click on Daily Tea Menu and peruse the new menu selections and new teas. Thank you all for your continued support and prayers as we struggle through the challenges with reopening our tea shop. We are still looking forward to greeting you	personally and “catching up”. Indulge in the pleasures of afternoon tea. 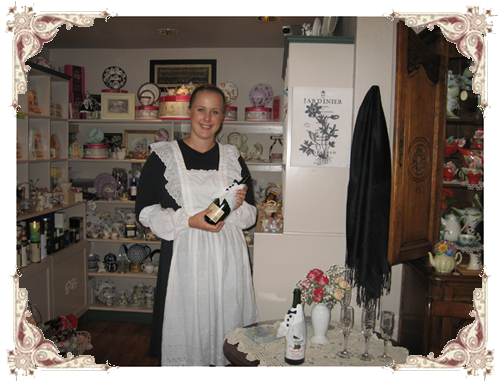 The world slows down once you enter Lisa's Tea Treasures Tea Salon & Gift Parlour. The tantalizing aromas of freshly baked scones and fragrant tea blends waft through the air. You are greeted warmly at the door and led to your table. As you nestle into an elegant armchair or settee, the soft glow of lamps and the perfume of tea begin to work their soothing magic. The linen-clothed table is laden with china and silver, and a small bell to ring for service. As you are presented the menu an adventure unfolds. Experience Afternoon Tea from the far corners of the world, each tea plate set to the theme of a distant land. Your repast features a cozied pot of a Lisa's Tea Treasures exclusive tea blend. Thoughtful complements include tea sandwiches, savories, and sweets. You'll want to make the afternoon last by bringing home a bit of tea to enjoy time and time again. Think of Lisa's Tea Treasures when our elegant ambiance sets just the right mood for celebrations, whether for birthdays, showers, or just taking time to enjoy a cherished friendship. Business meetings are offered a refined setting to carry on conversation. Our Tea Salon is also a delightful place to introduce your favorite little one to their first tea. Ring us today and we'll make arrangements for your well-deserved respite.